CCP Sining Alamin: 13 Artists Series presents the last leg of the forum series entitled, "Photography and New Media." This will be held on February 20, 2013 from 2 to 4 pm at the MKP Hall, 4F Main Theater Building, Cultural Center of the Philippines. 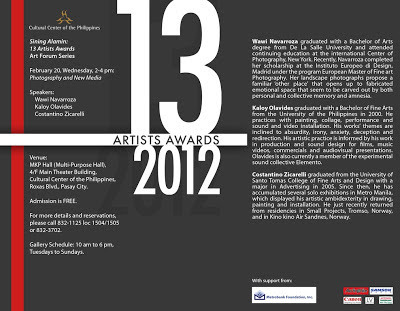 Panelists for the forum will be 13 Artists Awardees Wawi Navarroza, Kaloy Olavides, and Costantino Zicarelli. This forum will also mark the last week of our 13 Artists Awards exhibition. It is on view until February 24 (Sunday), at the CCP's Bulwagang Juan Luna (Main Gallery), Pasilyo Juan Luna (Main Gallery Hallway), Pasilyo Guillermo Tolentino (3F Hallway Gallery), the main elevators and the grand staircase. Gallery hours are from 10am-6pm.